The procedure for electing a cost basis method depends on whether shares are covered or noncovered. Your mutual fund shares are divided into two categories. Covered shares — generally any shares purchased after 2011 — are covered by rules requiring brokers and mutual fund companies to report cost basis and holding period in addition to sales proceeds when you make a sale or exchange. Investments acquired earlier are noncovered shares. The average basis method applies separately to these two categories of shares, and procedures for electing that method depend on the category. You can elect averaging for shares in one account while using the separate lot method for shares in a different account. The old rule that required taxpayers to apply averaging to all identical shares they owned, even if held in different accounts, no longer applies. For purposes of these rules, shares of different mutual funds are treated as separate accounts even if held in the same investment account. You might use averaging for a bond fund, for example, while using the separate lot method for shares of a stock fund held in the same investment account. What’s more, these rules treat covered shares and noncovered shares as separate accounts, even when they’re shares of the same mutual fund and held in the same investment account. Here again, you can elect averaging for one but not the other if you wish. If you elect averaging for both, you’ll have separate averages for each category. 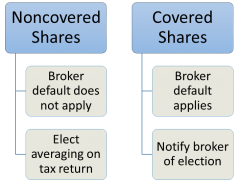 For covered shares, the procedure for electing a cost basis method depends on the default method of the broker or mutual fund company where you invest. This is the method that will apply to covered shares held by customers who don’t specify which method they want to use. It appears that the vast majority of mutual fund companies are using the average basis method as their default. Brokers may be more evenly split. Schwab is apparently using the average basis method as its default method, for example, while Etrade apparently is not. Check with your broker or mutual fund company if you’re unsure which method they use as the default. Separate lots as the default. If you invest with a company that uses the separate lot method as the default, no action is required to use that method. You can elect to use the average basis method for your covered shares at any time by notifying the company in writing. Electronic communication counts as writing, so checking the appropriate box on an online form would satisfy the requirement. This choice applies to any sales of covered shares of that mutual fund from that account occurring after you notify the company. You can’t elect averaging for sales that occurred before you notified the company, however, even if they took place earlier in the same year. Averaging as the default. If your account is with a company that has chosen the average basis method as its default, no action is required to use that method. If you don’t want to use this method, you need to notify the broker. Be aware that you can be locked into averaging for covered shares acquired before you notify the company unless you meet the deadline for revoking an averaging election. See Changing Cost Basis Methods. Transfer to new broker. If you transfer shares from one broker to another, your choice of cost basis methods does not transfer with the shares. You need to know the default method of the new broker, and notify them if it does not match your preference. The default method of your broker or mutual fund company doesn’t apply to your noncovered shares (the older ones, for which these companies are not required to report basis). You may receive a report from your mutual fund company showing the basis of noncovered shares you sold, calculated based on the assumption you’re using the average basis method. This information is for your convenience, and does not determine whether you’re using the average basis method. Regardless of the company’s default method, you use the separate lot method for noncovered shares until the year you elect averaging. According to the tax regulations, to do this you “indicate on the return” for the first year for which the election applies that you used average basis for a sale. It should be adequate to include “avg basis” in the description of this sale on Form 8949, or you can attach a statement to your return (“Average basis method used for noncovered shares of XYZ Fund held in ABC account”). It seems likely that many thousands of taxpayers have used the average basis method without meeting the technical requirement of “indicating on the return” that they’re using the method — and without hearing any objection from the IRS. Don’t lose any sleep if you’ve done this in the past, but follow this requirement for returns filed in the future. Because you don’t make this choice until you file your income tax return, you’re choosing whether or not to use averaging after you’ve already sold some of your shares. This hindsight — which isn’t available for sales of covered shares — applies only to the first year you sell any of these shares. Averaging will automatically apply to any subsequent sales of noncovered shares of the same mutual fund from the same account.